Summary : Tableau Public is a free tool that allows anyone to create interactive chats and maps. 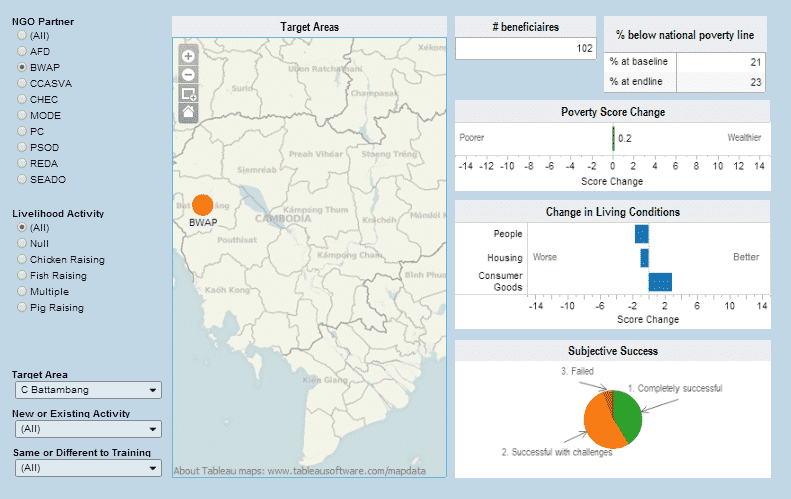 Do you ever wish you could send your donor a cool interactive map showing the results of your project, rather than just a boring report or PowerPoint presentation? Well, now you can. Tableau Public is a free tool that allows anyone to create interactive charts and maps (referred to as a “data visualisation” or “viz”). To see some examples of what’s possible check out the Tableau Public Gallery and Viz of the Day. The process is very simple. You start by downloading and installing the software on your computer. Then you open your data set from an Excel or text file. Finally, you can combine multiple charts into a “dashboard” that includes buttons for the user to filter the data. 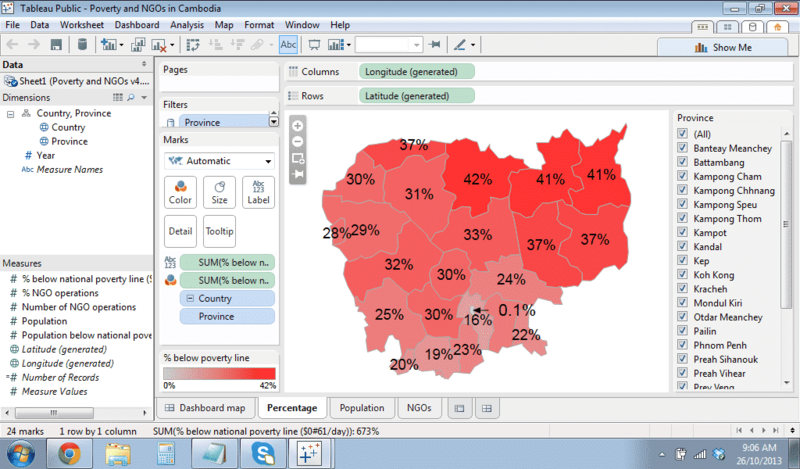 For example, the dashboard may allow the user to select a particular province in Cambodia so that only the result for that province will be shown. 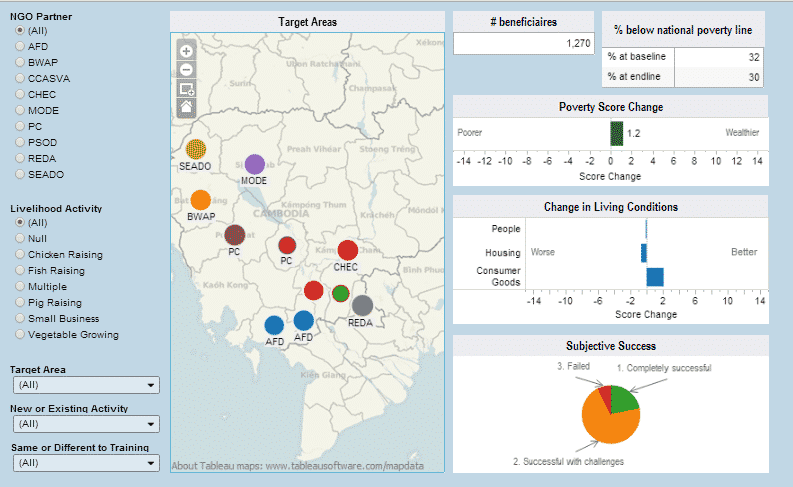 I’ve used Tableau Public to liven up presentations and to report program results to stakeholders. If you’re able to use pivot tables in Excel then with a bit of trial and error you should be able to use Tableau Public quite easily. If you aren’t very familiar with pivot tables then you should start by watching the training videos available on the Tableau Public website. They even run live introductory webinars for absolute beginners. Tableau Public has an excellent range of features. Almost any type of chart you could imagine (and many that you couldn’t imagine) are available. However, it does have one very serious limitation for people working in international development – it needs the internet. When you use the free version of Tableau Public all your visualisations are saved online. They can’t be saved to your desktop. In developing countries where the internet is unreliable this can be a serious problem. I’ve spent hours tinkering with visualisations to make them perfect, only to have all my work lost because the internet dropped out and I couldn’t save it. The free version also requires that all your visualisations can be seen by anyone online. This can be a problem if you’re working with sensitive data. There are also other limitations, such as not allowing data sets with more than 1 million rows. All these problems can be overcome if you’re willing to pay for Tableau Personal Edition, but with a price tag of $999 it’s beyond the budget of most smaller and/or local NGOs. Note: Tableau Software offers one-year free trials to students through their academic program. Tableau Public is a an excellent tool that allows you to view data in a more interactive and interesting way. You want to create interactive maps, charts and visualisations from raw data. Your data set is available in Excel or a text file. You want to share your results publicly. You don’t have a reliable internet connection. Your target audience doesn’t have a reliable internet connection. You are working with sensitive or confidential data.